This originally ran as a series of articles on the now-zombie website Seattlest in October 2010. The old photos are from circa 1974. I picked them up at an antique store. They came from T.V. Dean Realtors, who were probably appraising the building before sale. The new photos are from 2010. Bonus material at the end. There were frequent suicides from the start, when Alki Hotel opened at 5th and Washington in 1910. A storm toppled the south wall in 1934, burying a man in debris in the building next door. Perhaps all of this negative energy channeled through the lonely man in Room 59. What was the writing on the wall? Clearly visible in the 1974 photo are the remnants of an old “Owl Cigar, 5 cents” ad. They used to be all over downtown Seattle. Up in the top left it said “Hotel Alki”. Both of those have been covered over with brick-color paint now. That’s not the writing we’re talking about, though. 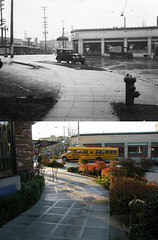 The Alki was closed down in 1970, forcing all of its tenants to find new housing. They left behind their community, their memories, and their sense of home. One of them, in Room 59, left behind something extra: poetry scrawled across the walls. It was discovered during a 1972 inspection by the Skid Row Community Alliance. As friends, we go on. night hours, they come slowly. for the days I die. This old photo was actually taken halfway up the hill to the Nippon Kan parking, now covered by SHAG’s Terrace Apartments. Check out the extra photos for a similar view in 2002 (covered by a dog), and Terrace’s construction in 2005. The long, fifth-floor corridor is littered with the leavings of a hundred nameless men who have gone to other places, perhaps to other worlds, since they lived in what was once the Alki Hotel. Here are things they could not or would not take along when the time came to leave – a vanity mirror propped against a wall, an old pair of pants in a heap on the floor, bits and pieces of torn magazines and yellowed newspapers. The Skid Road hotel has been closed for three years or so, shut down because the building did not meet city fire and building codes. There were no sprinklers and no elevator; now there are no tenants. Except for the notion of ghosts and other things that move and creep in the cavelike darkness, the building is empty and silent, as if listening for voices long since stilled and waiting the return of the faceless men who once lived in the little cubicle-like rooms and shuffled on slippered feet along the faded carpet in the hallway. One of those nameless, forgotten men – the tenant in Room 59 – left more than discards. Dumas had his room at the Alki Hotel from 1964 [when he was 15-16] until 1970 when the hotel closed. “If you’re some kind of creative person and you really want to stay in Seattle you almost have to be alone to be an artist,” Dumas said. That was part of the reason for the hotel room. Another part was in getting away from [home problems in the] Central Area and simply having a place to live. “I got in with some people I knew. I saw them living; I saw them dying, you know. I saw junkies down there and I saw alcoholics and I saw the roaches… It was like a ghetto down there. Dumas was the last person to leave the Alki when the old hotel was closed. “I was under the impression they were going to tear it down for a parking lot,” he said. “I said, man, that’s really going to be something when they tear it down and find a piece of board with some writing on it and it’s going to be like hieroglyphics. I haven’t discovered what happened to Aaron Dumas. He shows up on old documents on the Internet through 1975. There are oral histories of men involved in the black power movement and black activists who refer to Dumas’ plays and poetry as part of their formative years. In 1988 the old Alki was renovated and opened as subsidized housing under a new name, Ascona Apartments. I Fred Mainor Sr. Grew up with.hAaron and the Dumas family. He was a good kid,at times pretty quiet. We all lived in the projects in Tacoma later to relocating to Seattle. Do you have any idea what happened to him? Did you keep touch with him in Seattle when he lived in Pioneer Square and wrote poetry? No I haven’t seen or talk with any Dumas family members since I believe 1981. There mother had just passed in Seattle. I’m not at all surprised at Aaron poetry, he and My late brother Rayfer Mainor also a poet who also published poetry was as kids quiet and seemed to always be thinking. I went to Vietnam November 1964 at age 17 years old, and later lived in Calif. Nowadays live in Waco Texas. Will be moving back to Pacific Northwest hopefully in September this year. If you hear from Aaron let me know. Fred Mainor Thank you. We finally lost our traveling connection with Aaron Dumas on July 13, 2017 after his year long carry of cancer. Some tribute can be found on a website http://www.blackartswest.weebly.com. we welcome contributions.More items to tell about his joys of life and our history with him.